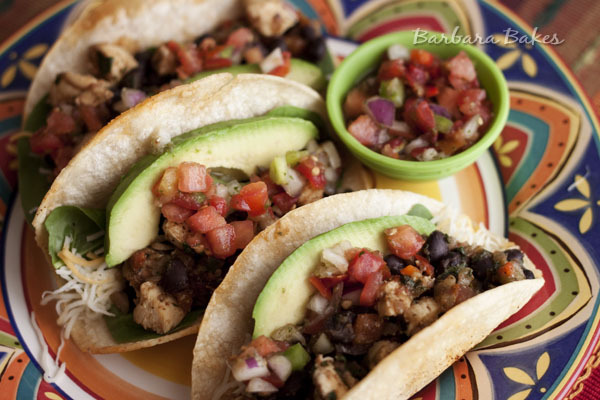 Crispy baked corn tortillas filled with chicken, black beans, spices and fresh salsa. 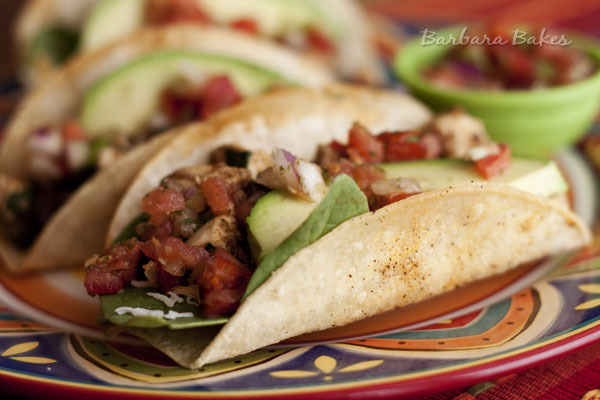 An easy, quick, healthy meal that would be perfect for any Cinco de Mayo celebration. Last week at Harmons, they were sampling a Hearty Taco recipe made with Harmons fresh mild salsa. It was a great combination of flavors, so I brought the recipe card home and put it on the menu for this week. 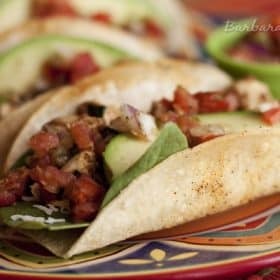 My kids like to order hard shell tacos when we eat out, so I thought it would be fun to make them at home. Eating Well posted an easy, baked Crispy Taco Shell recipe that was a perfect match for the Chicken and Black Bean filling. If you drape the tortilla over two of the oven rack rows, you’ll get a flat bottom taco shell like Old El Paso’s Stand and Stuff Taco Shells. Then you’ll have more room to load up your taco with all your favorite toppings. My daughter was visiting and stayed for dinner the night I served these tacos. She declared them muy deliciouso! If you’re looking for more delicious Cinco de Mayo recipe ideas, Pam, For the Love of Cooking, and Rachel, Simply Fresh Cooking, did delicious recipe roundups; and Anna, Cookie Madness, and Liz, Hoosier Homemade, posted Cinco de Mayo treats. So there’s no excuse for not eating well on Saturday. Sauté chicken, onion and garlic in olive oil in a sauté pan over medium heat until the chicken is no longer pink. Stir in beans, cilantro, cumin, chili powder, salt, pepper and salsa. Cook until heated through. Serve on crispy baked taco shells with shredded cheese, lettuce or your favorite taco toppings. Coat one side of tortilla with cooking spray and sprinkle with a little chili powder and salt. Drape each tortilla over two rows of the oven rack and bake until crispy and brown, 7 to 10 minutes. These Look Fantastic!!!!!! Totally a great idea to hang the tortillas from the rack like that versus holding them in loads of oil. Love it! What a great idea for baked taco shells! I’ll definitely have to give it a try! The taco filling has so much flavor but I have to say I really love the idea for the taco shells. I am definitely trying this! These look amazing. And I had no idea you could crisp up the tortillas that way! Yum, I really want to make those baked crispy shells. Oh yum! I love the crispy shells. And black beans and chicken filling? Double yum! Awhile back I tried that method for baking the tortillas and we really liked it. It’s nice to have more room for all that delicious filling. Your tacos look incredibly tasty! What a scrumptious weeknight dinner! Crisping the shells in the oven is a great idea. I usually warm the tortillas in a skillet for soft tacos. My family would love crispy, crunchie! i can’t wait to try this taco shell trick! Made this for dinner tonight!!! It was soooo. Good!!! Hi! 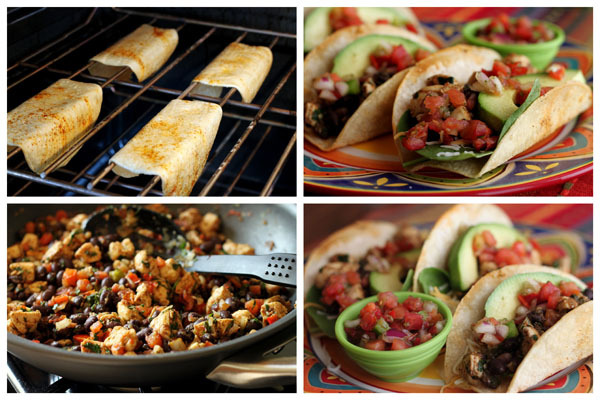 Wow, these tacos look incredible and I love the idea of the crispy taco shells. I know we would devour these at our house! 🙂 I’m enjoying looking at all the yummy recipes on your beautiful blog and subscribed by email so I can follow along! Have a great evening!